A signature program and significant defeats for the freshman mayor in his first state budget. 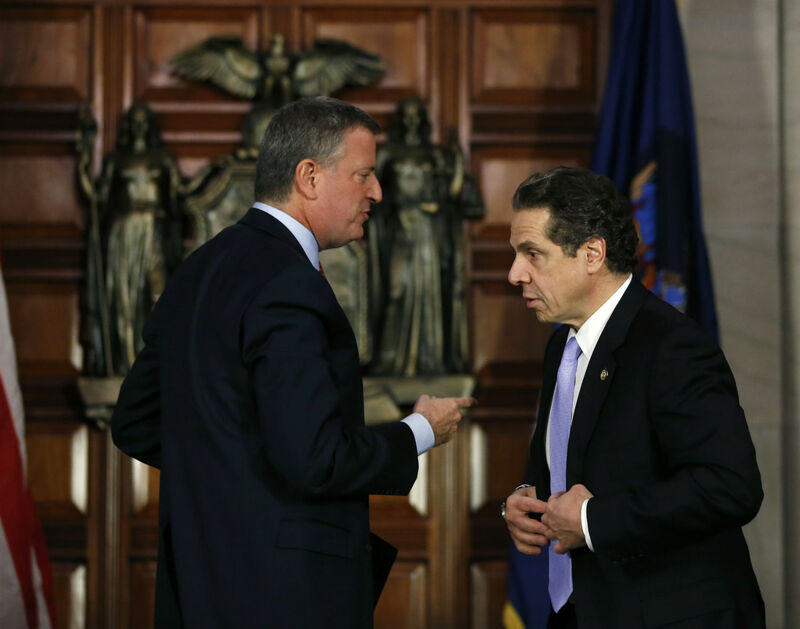 Bill de Blasio got what he needed out of the state budget that was unveiled over the weekend: $300 million a year over five years to run a universal prekindergarten program that was the centerpiece of his mayoral campaign and that many skeptics said would never be funded. He also got the state to back off a petty fight over a costless change to budget language that will allow the city to operate a housing subsidy program to begin reducing its record-high homeless shelter numbers. But the mayor did not get all the money he wanted to get for UPK, or the dedicated tax on high earners he wanted to pay for UPK or very much for the middle-school after-school program that was part of the UPK concept. He did not get the ability to hike the city's minimum wage or the authority to install more traffic-enforcement cameras in the city, which he'd sought as part of his VisionZero initiative—his flagship public-safety program. And in the budget the state stripped the city of much of its control over the siting of charter schools—rescinding de Blasio's recent decision to deny co-locations to three schools, requiring the city to give charters space in public schools or pay for private space, giving charters the ability to challenge through arbitration the siting decisions made by the city and prohibiting the city from charging charters rent. In other words, every effort de Blasio made to wrest from the state greater control over city policy ended in failure, and City Hall lost power over charters, too. Some will say those high casualty numbers indicate a failure of strategy or tactics on the mayor's part, but I don't think that's the case. Winning approval for his signature policy program is a very big deal. De Blasio's UPK push has to get some credit for pushing the governor to provide way more funding than Cuomo proposed in his budget address. On the other items, it's not certain de Blasio would have gotten more by asking for less. The governor and a state Senate effectively controlled by a small but growing breakaway group of centrist Democrats were simply never going to give him very much at all. And given the breadth of the benefits the budget confers on charter schools—a stunning act of hypocrisy, by the way, for a state that has chronically and unconstitutionally underfunded public schools and that supposedly believes in “mayoral control”—it seems obvious that while de Blasio's bungling of the PR on the co-location decisions may have provided a pretext, the charter wish-list in the budget had been drawn up a long time ago. Contrary to the way it's been portrayed, De Blasio didn't wake a sleeping dog with his co-location reversals; Cujo was already up and waiting in the bushes. Failure is ambition's shadow. Leaders who want to change a lot are bound to come up short much of the time. Not to equate the mayor's stature with FDR's, but in pursuing his own transformative agenda, President Roosevelt suffered a number of setbacks which must have seemed devastating at the time; the Supreme Court overturned many a New Deal program, leading to the biggest flop of them all, the absurd court-packing plan. But these losses aren't what comes to mind when we think of FDR. The successful programs, like Social Security and all the public works efforts, are.